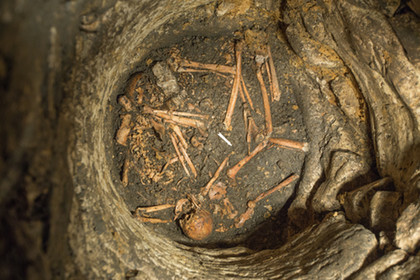 The bodies of between twenty and thirty people have been discovered in a well by archaeologists in France. The discovery was made by a team working for the Institut de recherches archéologiques préventives. They were just finishing a five-month dig of a Gallo-Romano site at the town of Entrains-sur-Nohain in Burgundy, in which they discovered the remains of several stone houses, a Roman road, forges, and even some small bath houses. The archaeologists had excavated one of the wells on the site when they came across the remains of many skeletons at a depth of about four metres. The bodies of between 20 and 30 individuals seem to have been dumped into the well at the same time, and include men, women and young children. Carbon 14 Dating has found that the skeletal remains are from the between the 8th and 10th century. The archaeologists believe that they may have the civilian inhabitants of this area who were massacred, perhaps by Viking raiders or in the internal conflicts of the Carolingian Empire. The Battle of Fontenoy-en-Puisaye, which took place in 841, occurred only about 25 kilometres from Entrains-sur-Nohain. Another possibility is that these people were victims of an epidemic. The archaeologists are planning to conduct further tests on the remains to get a more exact date when they killed, and to see if the have any signs of trauma or disease.